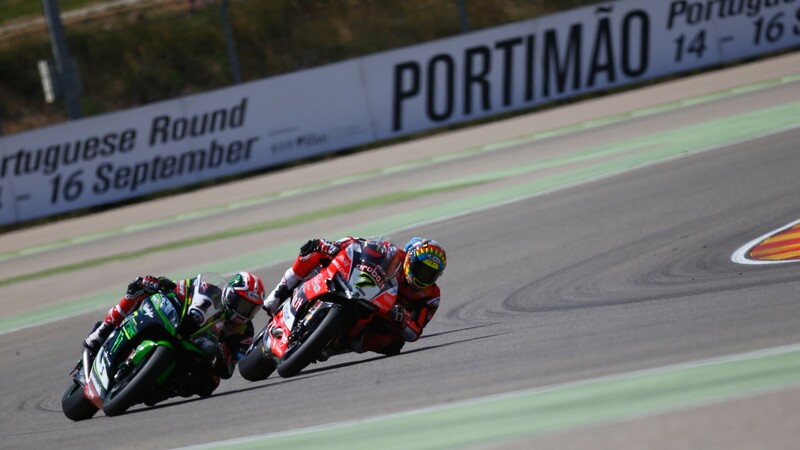 The first European round of the 2018 MOTUL FIM Superbike World Championship season saw Chaz Davies (Aruba.it Racing – Ducati) and Jonathan Rea (Kawasaki Racing Team WorldSBK) split the honours and come away from Spain having once again shown themselves to be the class of the field. The duo have dominated the standings in recent years, and at MotorLand Aragon they went toe to toe once again. The Ducati seemed to have the edge in Spain - as shown by the legion of leading Ducati's - but Rea was able to fend them off in Race 1. With Davies coming through the pack on Saturday following a Superpole crash, it was a case of damage limitation for the Welshman. Sunday's race however was a no holds barred battle, and one that showed how deep Rea was having to dig on the Kawasaki. The triple WorldSBK champion needed to give everything he had in Spain to compete with Davies, and will no doubt leave Spain pleased to stretch his title lead to 12 points. The speed of the Kawasaki and Ducati's in Spain was close, but their pace was very different. The Italian machine was clearly easier to ride and get the most from but as we've seen in the past, Aragon is a favourite track for the Panigale and Davies. Assen on the other hand has been Rea's hunting ground. The Northern Irishman can move level with Carl Fogarty's total of 12 Dutch victories in Race 1, but it has been Sundays that have proved his Achilles Heel this year. Just like Thailand, Aragon showed that the Kawasaki rider is having to ride harder and more aggressively with other riders to make moves. In Buriram, Rea suffered a brake issue that caused him to run off track numerous times, and in Aragon it was clear that the Northern Irishman was worried about coming through the pack. It will be very interesting to see if the form of recent races hold true in the coming rounds. That chasing pack saw Yamaha lead the way once again in Spain, but it was also clear that the blue bikes were struggling. With mixed weather conditions on Friday, the duo missed out on two sessions to work on their settings, and Michael van der Mark (Pata Yamaha Official WorldSBK Team) and Alex Lowes (Pata Yamaha Official WorldSBK Team) were left playing catchup all weekend. With a promising weather forecast for The Netherlands, they will be keen to show that Aragon was a blip in their progress rather than a look into what to expect in the coming rounds. Re-watch the sensational WorldSBK action from the Pirelli Aragon Round, and prepare for the quick turnaround this weekend, all with the WorldSBK VideoPass.